Raven integrates data from more than 20 marketing tools and services. There are many more integrations on our roadmap. 1. General data that Raven provides for you. You don't need to use or subscribe to these services to see or report data from them in Raven. Yay for saving money! On the other hand, you can't access your specific account data if you do use or subscribe to them outside of Raven. *Google Ads, Facebook, Twitter, and LinkedIn are exceptions to the can't-access-specific-accounts rule. See below. 2. Specific data from your accounts, which you must allow Raven to access. As soon as you grant Raven permission to access your own accounts from these sources, you can manage, monitor and/or report on your specific data from them. Talk about a one-stop shop! 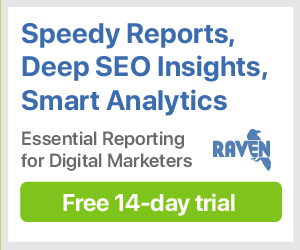 Want your favorite marketing tool or data provider integrated with Raven? Check out the list below to see if it's on the roadmap. Google My Business: In active development. Instagram: Ads data is available through Facebook Ads. Social data is not in active development, but being researched for the future. Twitter Ads: Not in development. Pinterest: Pinterest offers an API, but doesn't provide access to any analytics data at this time, which prevents us from being able to provide anything reportable. Don't see the one you're looking for? If it's not listed anywhere above, we don't integrate it and don't have plans to anytime soon. But that doesn't mean you can't ask us for it! Make your case in an email to help@raventools.com.